Concept of stuffing few files in one is old. There are numerous archive formats that are actively used. Aside from usual archives plenty of installer packages (or even executable files) use some form of compression and can be extracted. I had recently posted on TrID that helps identify file types. 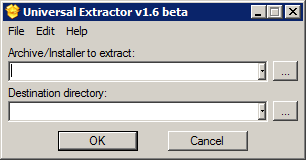 That made me remember another closely related program that deals with archives – Universal Extractor. Universal Extractor is complex script (written in AutoIt) that acts as frontend for included collection of unpackers. It identifies type of archive using TrID and attempts to use fitting unpacker. App doesn’t do anything complex but saves time required to find tool to unpack specific archive type. It is more of a tools bundle than single program. Unfortunately program seems abandoned. Latest usable version has beta status and hadn’t been updated for over a year. 1.6 final released! Because of bundle design you can simply replace outdated unpackers yourself but that reduces its value as time saver. I’ve also read on forum that TrID included in Universal Extractor was modified so updates from it doesn’t fit. In my opinion even if it doesn’t work with specific file it still has good chance to. Nice starting point. Freeware and open-source. Often described as portable but I had seen plenty people saying that it both writes to registry and leaves log files around. Works without installation describes it better. I faced some installation issues on Vista. Overall, it’s impressive, though. I am not much of Vista user. :) There is no-install version available there as well. This program is actually fully portable. Anyway, I usually use it to determine if a program is portable. I extract the files from their setup installers and run the executables to check. It’s not fully portable. It will work from flash drive, etc… But it leaves logs and registry entries behind, as post mentions. By the way simply running executable will tell if program works without installation, but not if it is completely portable as well. I am planning to script few tools together to make proper portability test (some day :).